Possibly a bigger challenge than creating recipes is naming them! Sometimes, there are lots of delicious ingredients in one recipe, so I feel a need to include as many of them in the name, knowing that different people are grabbed by different ingredients. But then, a recipe name can get rather wordy! Sometimes, I go for a silly name (like my Greeked-Out Gorgonzola Dressing or Wicked Good Chicken). My kids have opinions, too! With this recipe, I was feeling as though the name was getting a little long, so I omitted the reference to greens. Then it occurred to me that this is a recipe incorporating one of my food trends–bitter greens. (Click here for Rick Bayless’s Top 10 Food Trends and my part in the adventure.) It also occurred to me that omitting the reference was actually fitting. I have found that it is so easy to incorporate greens into so many recipes, from soups to salads, pastas and stir-fries. They easily slip into a multitude of dishes, adding color, flavor, and a nutritional punch. 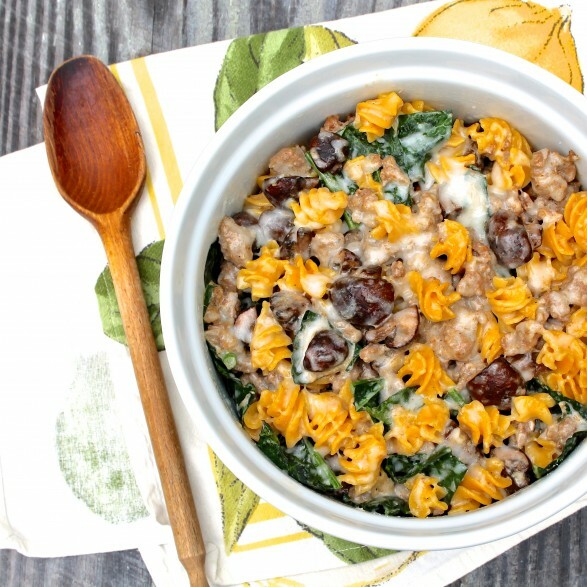 Likewise, stirring a cupful or two into any number of recipes is a terrific way to ease kids into eating their greens and a perfect way to introduce anyone’s palate to a new green, particularly something a little more bitter than frequently-used baby spinach. Cheese happens to be an ideal way to mitigate any bitterness and ratchet up the kid appeal. A green than I have enjoyed cooking with since I began this food trend journey is collard greens. This was a green I had largely overlooked, and I was sort of surprised that I truly enjoyed them. They pair well with sausage and Sargento’s spicier cheese blends yet work extremely well with the Four State Cheddar blend, which is a personal favorite. This time, I had a package of Sargento’s 6-Cheese Italian Blend in my cheese drawer, and it paired particularly well with the pasta and earthy portobellos in this dish. As luck would have it, there were no collard greens at market when I shopped for this meal, so I opted for kale instead. That is a beautiful thing about bitter greens: One can so easily be substituted for another based on availability and preference. And our old friend spinach will always be there in a pinch. Whichever green you end up choosing, you will be hard-pressed to go wrong with this recipe! For a gluten-free option, I use a quinoa-corn pasta, and no one ever knows the difference. Then, instead of making a typical white sauce using flour, I use the method described below. It is easy, delicious, and made extra creamy and gooey with the addition of a half cup of cheese. In a large skillet coated with olive oil, sauté the mushrooms over medium heat, stirring occasionally, until they release their moisture and become golden brown, about 10 minutes. Remove to a plate. Remove sausage from the casings and sauté ( in the same skillet) over medium heat, stirring and crumbling as you cook, until the sausage is cooked through. Remove to a plate. If you use pork sausage, you may want to discard some of the excess fat from the skillet at this point. I use a leaner turkey sausage and keep the little bit of fat that remains. Add the milk and cornstarch/water mixture. Bring just to a boil, reduce the heat to low, and simmer for 1 minute or until the cornstarch is incorporated and the mixture has thickened slightly. Stir in the salt and pepper and 1/2 cup of the cheese, stirring until just melted, and remove from the heat. 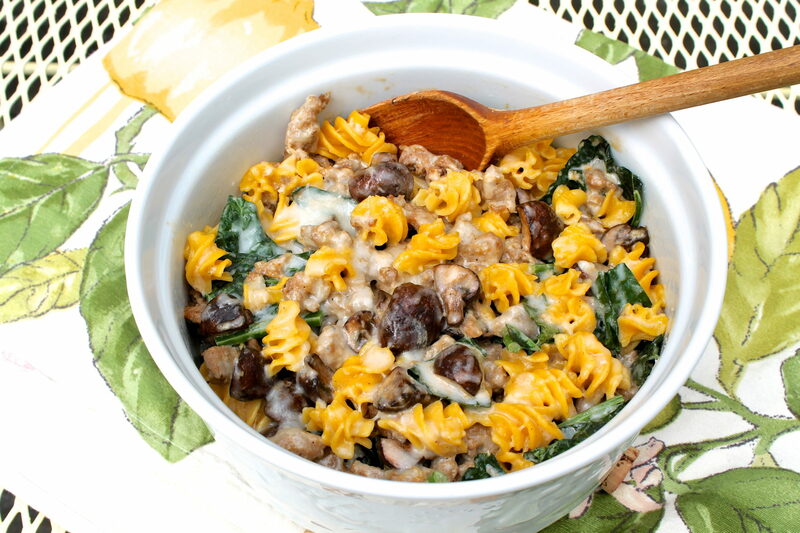 In the same skillet or the pot in which you cooked the pasta, combine the cheese sauce with the sausage, mushrooms, greens, and pasta. Transfer the mixture to a lightly-greased, 2-quart baking dish. Top with the remaining 1/2 cup of cheese and bake for 15-20 minutes or until the mixture is hot throughout and the cheese is melted.